For many women, owning functional bags that are both elegant and practical aren’t optional: it’s necessary. After all, the world tends to poke fun at women’s purses, even giving it the moniker “the black hole.” That’s because while most men can survive a full day with just their wallets, mobile phone, and keys, it’s a completely different world for women. Makeup, perfume, brush, hand sanitizer, wallet, mobile phone, chargers, cables, sunglasses… these are just some of the things you’ll find inside a woman’s everyday bag. Let’s face it: the truth is that women enjoy being prepared for whatever life has to throw at them, while feeling and looking good each time they step out of the house. This is also the same reason why ladies tend to go through several styles of everyday bags, since it can be a bit of a challenging finding that one fashionable yet practical bag that can be relied to store all your belongings on a daily basis. This is where the Longchamp Le Pliage Backpack comes in. Accessible French luxury fashion is evident throughout the bag’s design, so it’s no surprise that this style has become the ultimate go-to model for ladies of all ages. Chic everyday backpacks just don’t get any better than this. This foldable and packable bag can be taken anywhere; it’s lightweight enough that you can pack it up in your suitcase or duffel bag for your next trip. The straps are comfortable enough to wear on a daily basis without cramping your style. In fact, its iconic, timeless design will make you look fresh off the runway! Longchamp is a world-famous French brand known for their versatile and durable handbags and luggage. Their story dates back to 1948 when Jean Cassegrain began creating luxury leather smoking pipes. Longchamp, which quickly gained a reputation as one of France’s leading luxury goods manufacturers, eventually expanded into women’s handbags, shoes, men’s leather, and much more. Today, the brand is still a family-owned and run operation, and the Cassegrain clan’s dedication to quality and craftsmanship is still evident in every item carrying the Longchamp brand. The Le Pliage collection is easily Longchamp’s most famous. The Le Pliage collection, which is French for “to fold” and influenced by the Japanese art of origami, was an instant hit the minute it was released. The best-selling handbag became the most coveted bag for women all over the world who were attracted to its simple nylon design, practical features, and the wide array of colors it comes in. The Longchamp Le Pliage Backpack is a fun twist on the iconic Le Pliage handbag. It retains the most well-loved elements of the handbag, such as its foldable design, the many shapes and sizes available, and most of all, its durability. 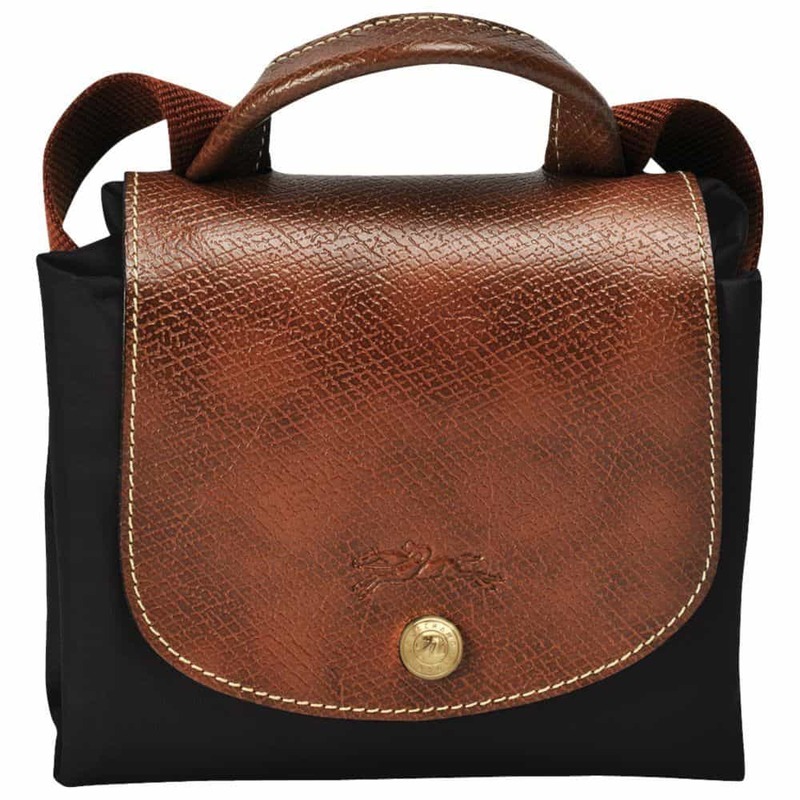 This fashionable backpack is ideal for ladies on the go, allowing you to keep your essentials close by and your hands free. It’s ultra lightweight with an embossed leather trim made with a water-resistant lining. The no-frills, minimalistic design of this bag includes just one small pocket located at the top by the zippered opening, and adjustable shoulder straps. 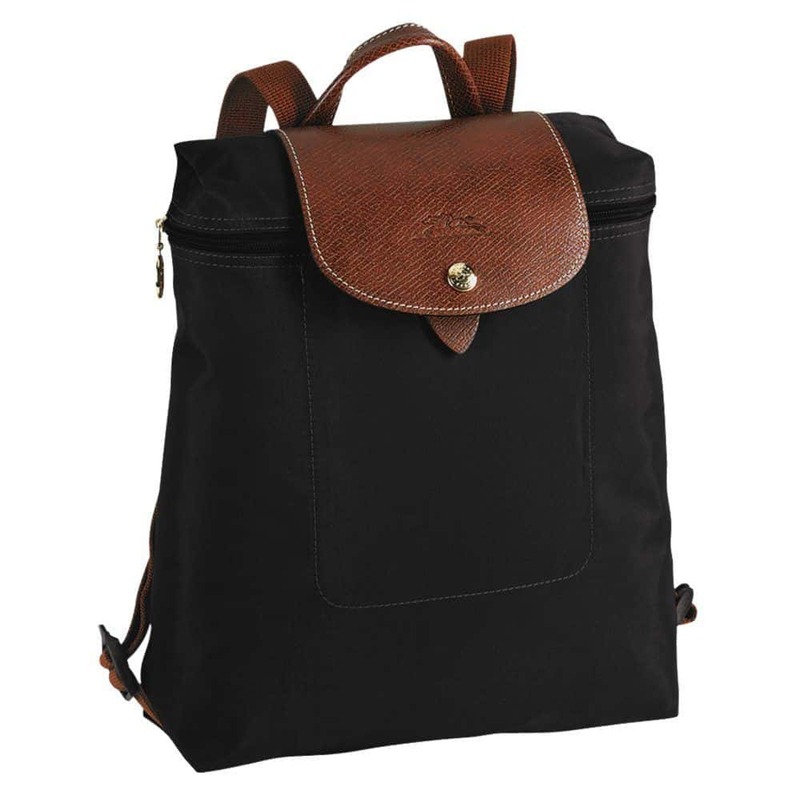 The Longchamp Le Pliage Backpack is the ideal fashion accessory for women on the go. You can easily take it with you traveling since you can fold it up to keep, or use as needed. It will barely take up any space in your luggage. This backpack is perfect for daily use, to and from school or work, on vacations, and even as a carry-on. Although the bag is lightweight, it’ll get heavier the more you pack into it. Despite it looking rather small, you’d be surprised at how much the bag can hold. If you crave organizational features, you can use small pouches within the backpack to keep your belongings neat. Of course, its elegant printed logo and leather trim are nice touches, too. Fashion-conscious ladies will also appreciate how its minimalistic style doesn’t choose your outfits. The Longchamp Le Pliage Backpack is a practical everyday bag for the fashion-forward woman. It will last you a long time thanks to its super durable and functional construction. Customers agree; this isn’t the kind of bag that one buys or is gifted with, and ends up in the back of your closet for years after. It’s extremely usable – in fact, for many customers with the Longchamp Le Pliage Backpack, it probably gets the most wear compared to other bags you own. Based on customer reviews, the simplicity and versatility of the Longchamp Le Pliage Backpack are its winning features. Customers take this bag virtually everywhere and don’t run out of a use for it. That’s money spent wisely! On the other hand, some customers weren’t too pleased with the absence of added compartments and pockets. This can easily be resolved with the use of packing cubes, pouches, and makeup bags. Overall, the Longchamp Le Pliage Backpack is a winner in the fashionable backpack market. It adds a touch of French elegance wherever you go, and is built to withstand years of daily use. There’s no need to travel all the way to France to get your very own Longchamp Le Pliage Backpack. Online retailers such as Lazada Singapore already offer this bag, and they can ship it to your doorstep within just a few days of ordering. The Longchamp Le Pliage Backpack is a timeless cult classic, loved by many women the world over. No matter what your personal style is, its simplicity will complement you. This is a fashion investment that you can’t go wrong with.